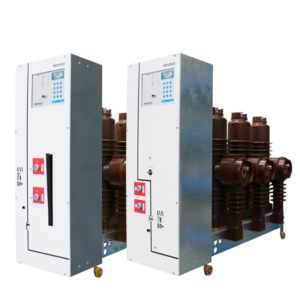 This vacuum circuit breaker of the spring mechanism type, is an extremly compact circuit breaker which is made for intergration in switchgears type Ring Main Unit and synonymous with high reliability and safety. The VA-3 concept offers the security and reliability with a large spectrum of possibilities in the range from 12 to 24 kV. Complete switching device for distribution switchgear. 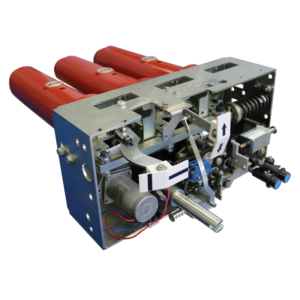 Made for integration in switchgears type RMU. Available in a wide spectrum of possibilities. Vacuum interrupters of the latest generation. Great withstand to extreme temperatures. Mechanical spring drive with exceptional longevity. Epoxy cast resin housing with secure ventilation fins, can be used under the most extreme climate conditions (IEC 60932, meth. (A)). Design and manufacturing in accordance with ISO 9001. Equipped with spring-loaded drive mechanism. VA-2 / VAS-2 : vacuum circuit breaker with side actuator. VA-2RP / VAS-2RP : vacuum circuit breaker with side actuator and integrated protection relay (RP600). WE BUILD MADE TO MEASURE. Mevoco’s R&D department has a lot of experience building made to measure solutions. Some of our best products were built co-engineering with our clients. Privacy Statement - Copyright © 2019 Mevoco nv - All rights reserved.